Come buy pizza and hang-out at home with the Jacobsons! 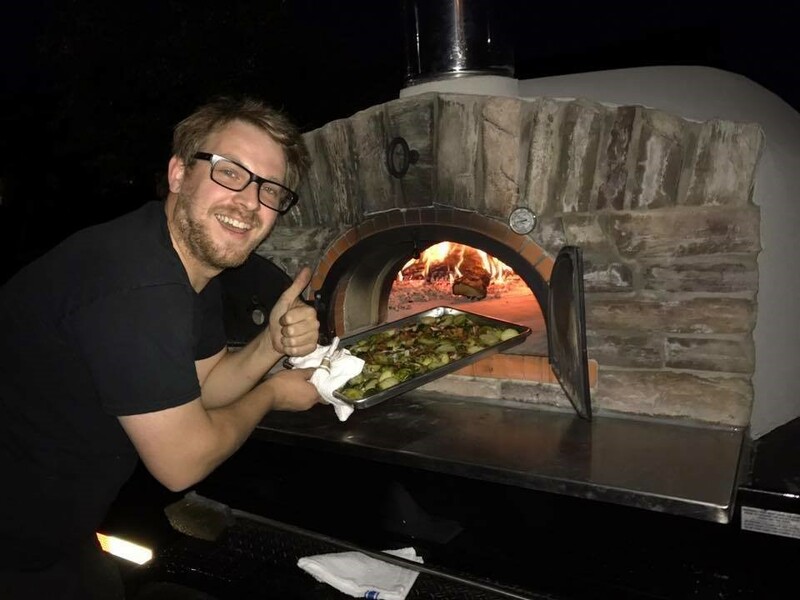 Our son David, The Chef, is bringing over his mobile wood-burning oven to make his gourmet pizzas right before your eyes! Gluten free pizza will be available. Please RSVP if you plan to attend! Also, let us know if gluten free pizza is your preference. All friends and family are welcome! With all that is going on in Washington DC, and as my progressing disability seems to be requiring more and more of my attention, I've re-prioritized the work I and Abilicorp will be focusing on. Eliminating federally regulated work disincentives for people with disabilities remains a high priority for me. Believing there's always a way to achieve ones goal, I've been thinking of ways to ensure workers with disabilities can receive services they need, cut healthcare costs for everyone and leave Social Security as a safety net for people who truly cannot work. Please read Community Independent Living Fund and give me feedback. The World Institute on Disability continues to work diligently finding states willing and able to pilot CareerACCESS. Piloting an employment services program that ensures each participant,working with a career coach, will receive the services, training and encouragement they need to build and continually grow their careers. Showing pilots successes should convince Congress and Social Security to change their antiquated definition of disability. CareerACCESS has been the main focus of my work for the last four years. It is very exciting to know there are great people at WID and in states throughout the U.S. who will now take CareerACCESS to its next level. Living with Cerebral Palsy, Go! Go! Go! One of my best friend and a great theologian, Ched Myers, always tells me we are here to tell our story. Recognizing that Denise Jacobson is undeniably the writer in our family, I nevertheless feel the urge to document the unbelievably exciting wonderful life I have. If not now, when? Please let me know if you have any questions or advice about any of these projects. This concept paper focuses on the design and development of a technology platform to serve the financial planning needs of people with disabilities who live independently and work in their communities. Americans with a disability can use 21st Century technology to manage the use of disability benefit systems while planning and building careers. The technology and expertise are available to develop these tools. Online budgeting and planning tools are available to clients of Charles Schwab, Wells Fargo, and other financial service institutions. Retirement and mortgage calculators are ubiquitous. The Disability Financial Management App will expand the features of such tools to include modeling changes in income for those who use selected state and federal government benefits systems while building a career, or transitioning into retirement from a job. Project Objective: Design and implement features people with disabilities could use in an online app to plan and better manage their personal budgets and funds in real time. Many users of this app may use, or need to use, public benefits including Social Security’s Supplemental Security Income (SSI), Social Security Disability Insurance (SSDI), Medicaid, and Personal Assistant Services. The app could serve budget preparation, planning and projection activities, and with crucial protections built in, could transfer funds or data to third parties using encryption technologies. Functionalities to should include budgeting modeling and calculations, disability benefits calculations and rules related to changes in income or status, fund transfers between financial institutions and others, bill payments, and data reporting functions both to the user and then to selected government or financial services with the user’s permission. Produce financial reports including reports required by government agencies. Organizations such as the World Institute on Disability (WID) and the National Disability Institute (NDI) have subject matter experts who could partner with financial institutions to develop such a project. WID has developed disability benefits calculators (DB101.org) that serve a range of state residents with disabilities who are building careers or changing jobs. These tools enable residents in Alaska (Fall 2016), Arizona, California, Michigan, Minnesota, Missouri, New Jersey, and Ohio to understand and better manage how wages can affect their state or federal disability benefits. The Earned Income Tax Credit and other benefits are also modeled within these free online planning tools. These tools and their technologies could be foundational for building an app with some or all of the features described above. Wells Fargo could develop and market the app on their own, or in conjunction with WID. With our 14 years of development and expertise in this domain, WID brings to the table its experience that no one organization on its own has the breadth and depth of capacities to develop this niche of online tools and services. WID needs new partners and sources of development funds to bring the design work and experts together that can shape and sharpen a scope of work from this concept paper. Wells Fargo could have a new, long term customer base with such an investment. Government cooperation and support would be solicited from the start of a design protocol. CareerACCESS (see CareerACCESS.org) is one of the WID initiatives that could integrate with designs and testing of the app platform outlined above. CareerACCESS pilot projects will test changes in federal policy aimed at significantly increasing the employment rate of people with disabilities by expecting young adults with disabilities ages 18 through 30 to work. CareerACCESS will provide support and services recognizing that disability benefits are offsets to the high costs of disability rather than subsidies for the inability to work. By better managing the complexities young adults with disabilities face in retaining benefits while building careers, this app will enhance career goal setting for CareerACCESS pilot project participants or anyone using public disability benefits. There are federal, state and local agencies with a maze of programming to assist people with disabilities with the high costs associated with managing disability. These costs include health care, personal assistant services, medications, durable medical equipment, accessible housing, and wheelchair accessible transportation. Programs that can support these costs are trying to get into and harder to navigate once found eligible. Each program has strict and different eligibility rules as to how much income and assets participants may have at application and after award of the benefit. Many programs have work incentive rules that can shelter income and assets to encourage participants to seek employment. Their current methods are also complex. Benefits specialists and lawyers are dedicating their careers to help participants get through the maze of processes, procedures, and regulations. National data on disability program beneficiaries reveals that most participants don't bother and decide it is easier and safer not to work. Apps that foster expectations and make it easy to plan financially, manage current benefits systems and build careers are investments worthy of smart financial institutions. Dr. Klest, thank you for seeing. Dr. Gerritz suggested surgery on my hips may enable me to sit upright without slipping thus reducing pain, discomfort, and sores I now get on my lower back. Knowing how busy surgeons are and since I have a significant speech impairment, here is a brief description of who I am and my resistance to surgery. Born in 1952, I have significant disabilities due to Cerebral Palsy. Since starting grad school at U.C. Berkeley, I use a powered wheelchair. I've always had a speech impairment that has degraded in recent years. Before my spine began to compress in 2009, I performed all my activities of daily living (ADL) independently. I drove vans. I traveled alone throughout the U.S. for my Wells Fargo job, my advocacy work, and vacations. My wife, Denise, also has Cerebral Palsy. We live in our home. We adopted and raised a son since he was 3 months old in 1987. We only used personal assistant services for cooking, cleaning, and assistance with our baby. Now I use personal assistant services for feeding, dressing, transferring, transportation, etc. My inability to sit upright has always been and continues to be problematic. As I child, I vividly remember my Mom yelling, “sit up straight.” During my high school and undergrad years, I propelled my manual by hooking my left arm over the wheelchair's handlebars and kicking backward. I drove powered wheelchairs by again hooking my left arm over the wheelchair's handlebars and steering with my right hand. In hindsight, my poor posture was probably a significant contributor to many of the physical problems I am now experiencing. However, given the freedom and independence I had, there are no regrets. I've always been fortunate not to have pain. I don't deal with pain well. In 2011 doctors suggested cervical surgery to delay spinal compression. Denise and I researched the ramifications of that surgery. I decided against that procedure consciously choosing eventual paralysis and loss of functions over possible pain. I admit the paralysis came quicker than I anticipated with more discomfort than I expected. However, I continue to be extremely thankful for being drug-free and able to take advantage of my cognition. I am also very grateful for the assistance I receive from great attendants. With help from a very resourceful neighbor, we have been able to make incredible adaptations to my wheelchair that minimize my discomfort. I am amazed at how changes measured in fractions of inches or degrees can determine the difference between pain and no pain. All adaptations we fabricate are reversible, ensuring that I am always able to return to a known state. I realize orthopedic surgery is not as dangerous as spinal surgery. However, knowing how sensitive to the pain I am, and knowing that no one is certain as to how my Cerebral Palsy really affects my sitting ability, and knowing that surgery is irreversible, leaves me very skeptical. After 29 years of working at Wells Fargo, I retired as a Sr. Vice President to start a disability-focused employment company that specializes in consulting on staffing and placement issues. I quickly realized that there are systemic problems that intrinsically inhibit people with disabilities from working and being productive. Our society holds very low expectations for individuals with disabilities. Defining disability as the “inability to work”to receive disability benefits is an inherent disincentive. I am dedicating the rest of my retirement to see that these old policies are changed. I am doing so by working with The World Institute on Disability where I am leading an initiative called CareerACCESS. As of June 1st, I plan to contract with Wells Fargo part-time, assisting them in developing a Disability Financial Management App. I much rather focus on these tasks than working on recovering from surgery. I promised Denise and my friends to keep an open mind when we meet. I'd appreciate knowing how many times you've performed the procedure on people my age with my degree of Cerebral Palsy. What were the goals and outcomes? What was the people's recovery experience? Would they do it again? I look forward to your analysis and recommendations.